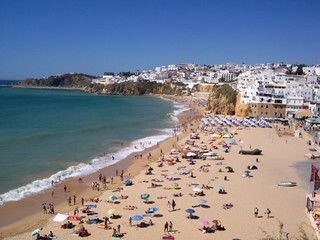 Albufeira in Portugal’s central Algarve on the Mediterranean coast is a popular destination for excellent reasons. The town was a small fishing village until the arrival of tourism in the 60’s. It nestles amongst multi-coloured cliff faces and is best known for its lovely sandy beaches and beautiful natural surroundings. Albufeira is only a a short distance from Faro Airport and is chosen by a variety of holiday makers for many different reasons. Finding a great beach is easy. You can expect fine sand, wind protection from the cliffs and turquoise blue sea. 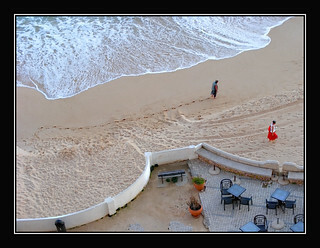 Peneco, Pescadores and Inatel, together make up the main Albufeira beach. There’s also the adjacent Fisherman’s beach (Praia dos Pescadores), the miles-long Gale or small and pretty Coehla beaches, nestling between tall cliffs. The sandy Baleera beach is opposite the main town. Alternatively, discover your own – there’s a lot of small anonymous beaches to choose from! The cosmopolitan and very pretty Albufeira Marina is also worth visiting for the colourful apartment blocks, grand boats, many interesting shops and lively restaurants. The adjacent rustic fishing port provides lovely views of Albufeira and its bay. Nearby pastimes can include Segway riding on the promenade, or boat, fishing and diving trips. Albufeira’s old town is a delight, both for the lovely streets leading up to it and also for its central square where you can relax amongst pretty gardens and classy bars or cafes. The castle towers are usually lit up on festive occasions and add to the old town’s atmosphere. 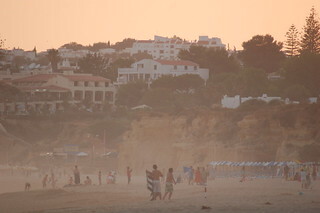 There’s also a lively nightlife scene in Albufeira; with many decent bars and clubs offering extended opening hours. 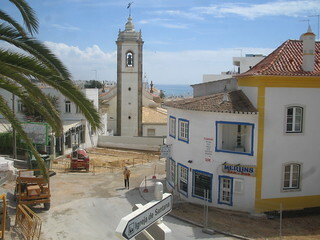 In addition to establishments in the old town, head for “the strip” (Avenida Dr Francisco Sà Carneiro) and Montechoro areas. Some beach night parties can be pretty spectacular too! For a short day trip from Albufeira, visit the 6-mile distance inland town of Silves, best known for its red sandstone Moorish Castle and characterful Cathedral. A longer trip to Faro the pretty capital of the Algarve region, is recommended for a Portuguese shopping experience and also its haunting Chapel of Bones, by the Carmelite Church. The old market town of Loulé, with decorative chimneys and Moorish castle ruins, is about 10 miles from Faro. Finally, a 90-min drive from Albufeira will take you to the picturesque “end of the world” fort town of Sagres, the famous launching point for many 14/15th century Portuguese exploration voyages.